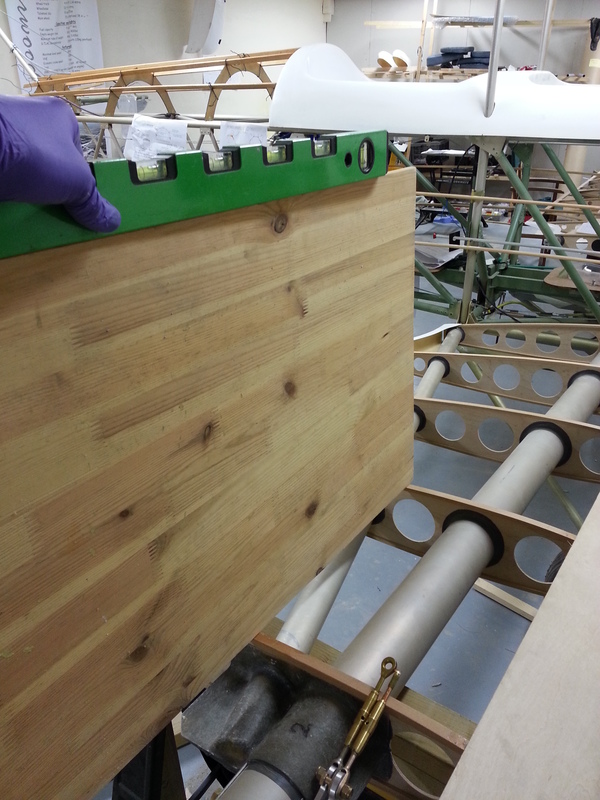 Busy night last night – as well as wings alignment it was time to start fixing the top decking. Now all the cabane is in place and the cross bracing is being finished off, the turtle deck isn’t planning on moving again. 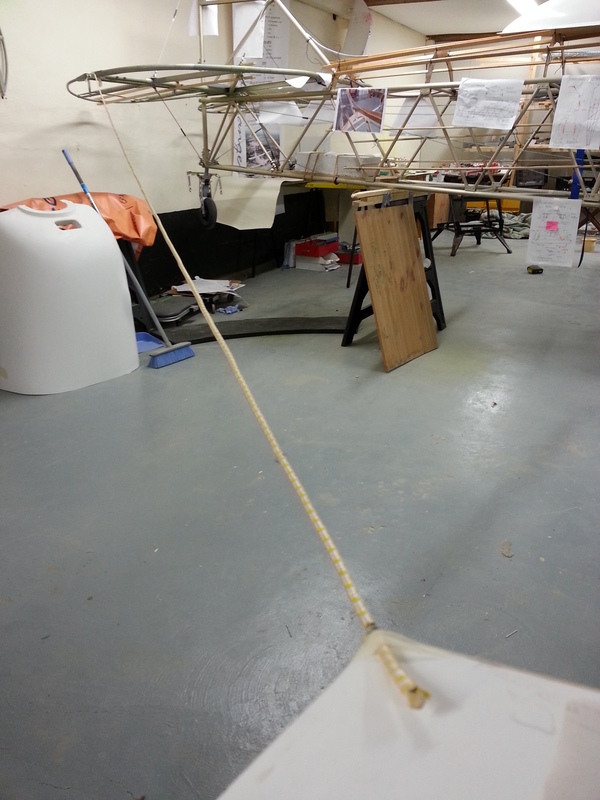 Glued all the stringers into position and also the fin strake. 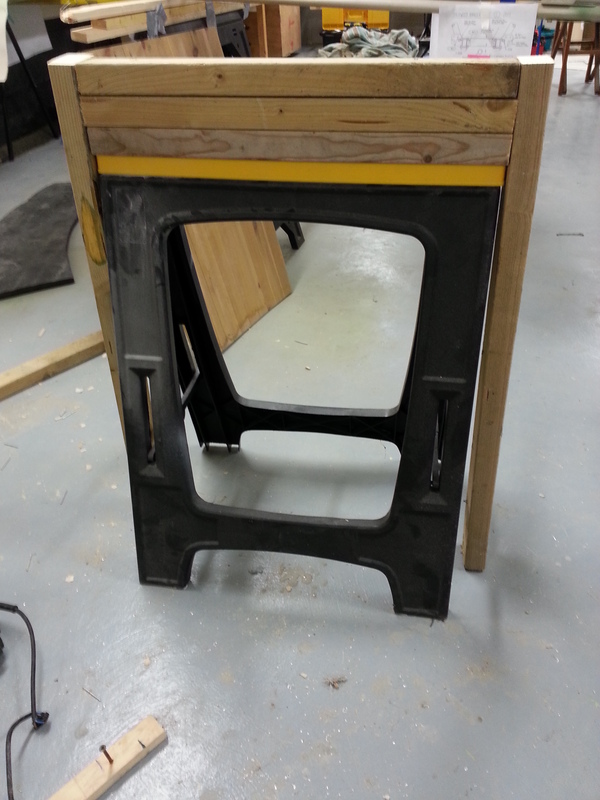 This will be riveted to the leading edge of the fin once all set and also bound to the centre stringer. Then I can look to fixing the centre headrest bubble. This has already been ply based and fibreglassed to provide additional quick access storage (a la Kevin Crumplins design). 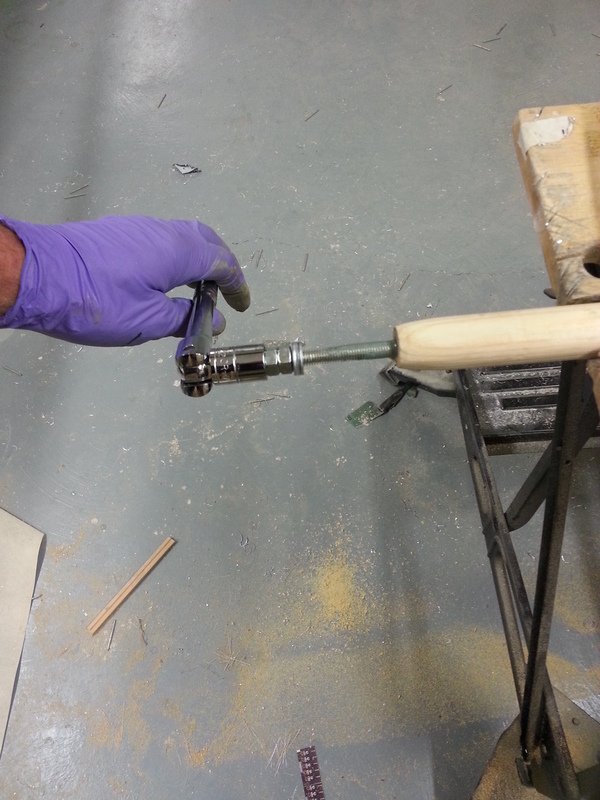 One of the early checks you can do is to check if you have built in any warp/twist. Just before I drill the wing securing bolts is as good a time as any to check ! I didn’t have the paper on me late last night that shows the control checkpoints (which are actually trailing edge of wingtip to fin post) but I did check trailing edge of wing to trailing edge of Tailplane. 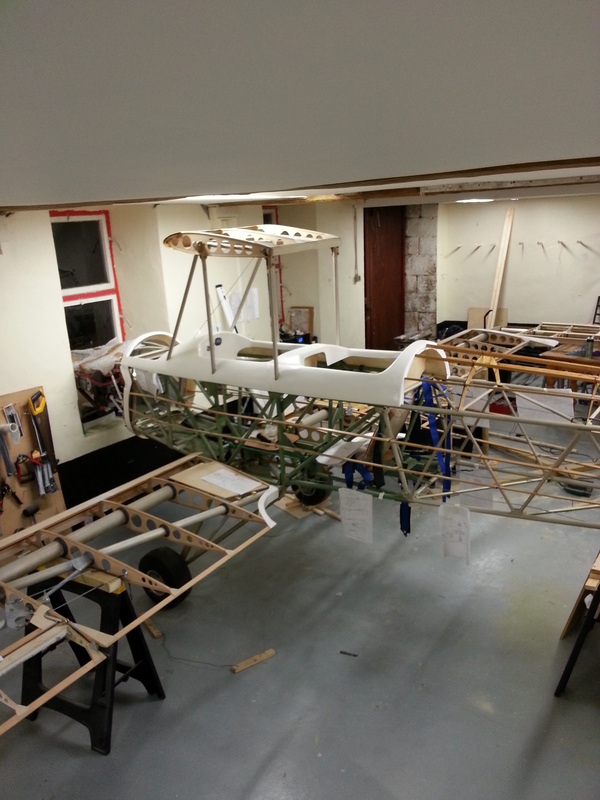 The lower wings – apart from polyurethane (planned for this weekend) are now ready for final alignment and fit. 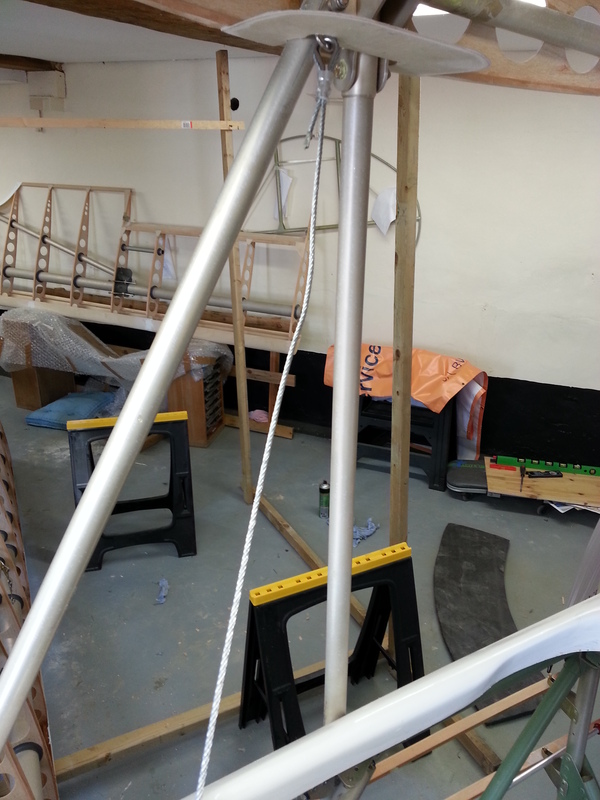 The trusty old trestles now have to be re-jigged and set to take the weight of not only the bottom wings but the interplane struts and then the top wing in preparation for the rigging. 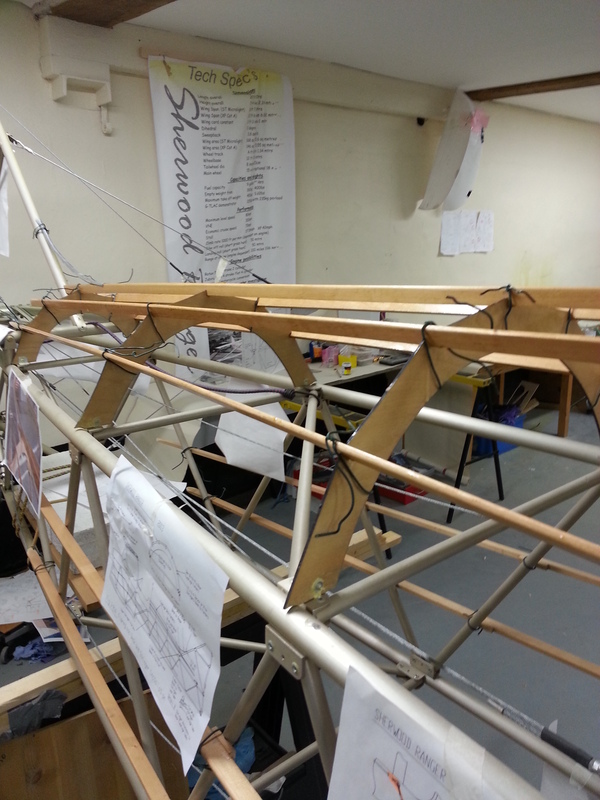 The first thing was to level the fuselage fore and aft and laterally. This took some doing as an old barn is hardly likely to be level. 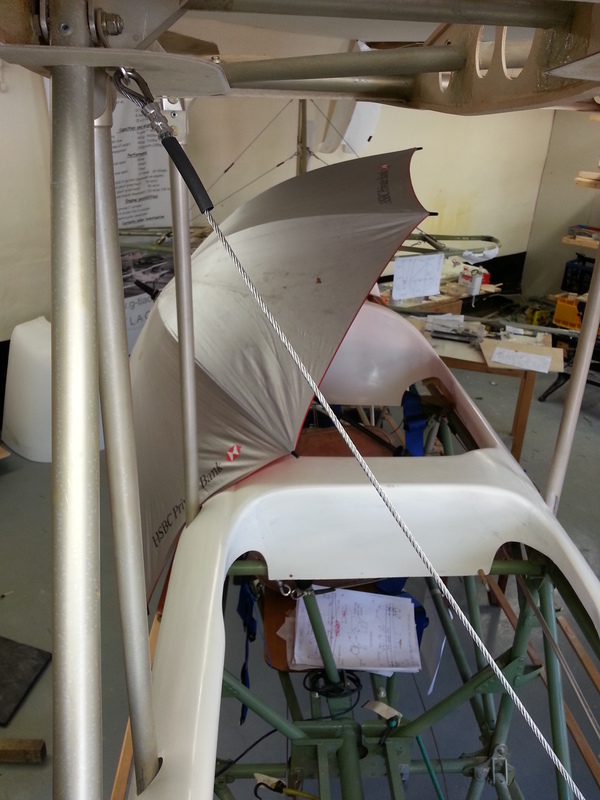 Having opted to not remove the engine – the aircraft is trestle at the rear and has a large painted breeze block tied securely in to stop her tipping on the nose. That gets fore and aft sorted. The lateral was a little trickier and took some packing under the starboard wheel to settle her nice and level. A chunky (not flexing) dihedral board has been made up and needs to be long enough to span 3 ribs to ensure you get a measured / accurate slope. With a 3 degree slope cut in the bottom – and placed the CORRECT ! way around, a spirit level on top should read zero. 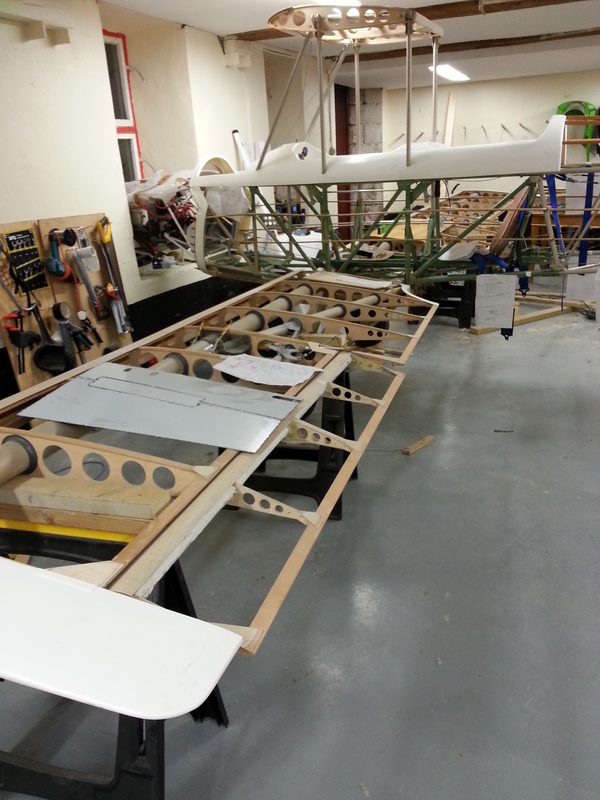 The main wing trestles (two each side) have been really useful whilst working on the wings but now need beefing up as well as packing up to take up the gap now in place with the 3 degree dihedral. 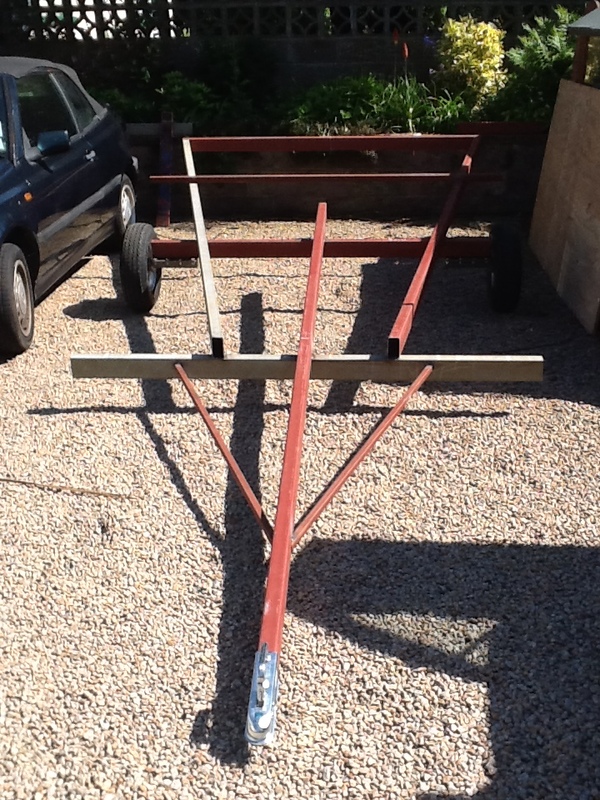 The trestles have now not only had packing but vertical support posts to ensure no flexing takes place. By doing this to all 4 trestles you get a very robust platform from which to work. 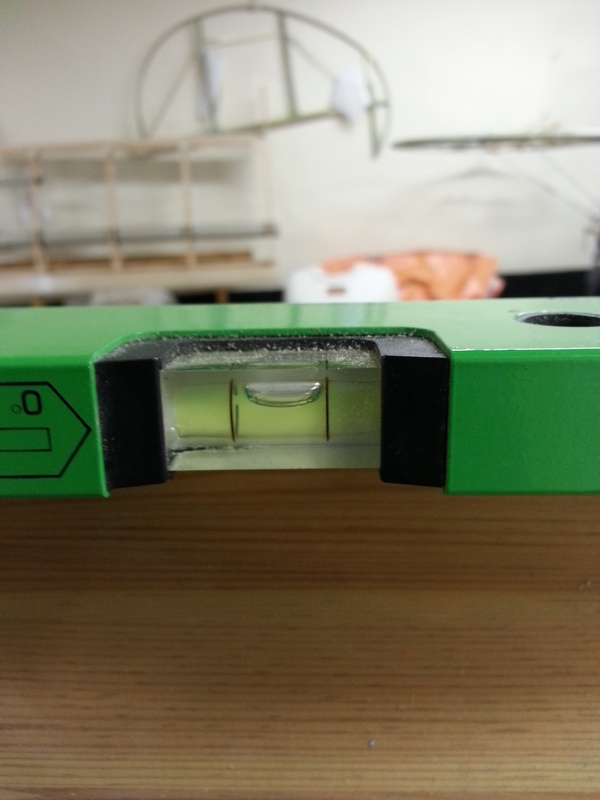 The plan guidance advises locating the supports very close to the point at which the strut supports locate – a busy area on the wing as this is where the aileron bellcrank is. You know that nagging problem … you’ve done something … you have 100’s of little but important jobs to finish and you keep looking back at that bit that wasn’t quite right … yes I am sure it will be fine …. carry on with other bits … then you look at it again … sure it will tighten up and straighten out …. get some other bits ready to do .. then you go back and look it critically ! You just know it will nag and nag and nag ….. better to just maker the decision up front and scrap it ! Its only a piece of wire and a thimble BUT threading it through the top cabin fitting I slightly crimped the cable and now it has a small kink in it … I will stare at it in front of me EVERY time I fly …. nope … scrap it … make another …. Ironically it takes far longer agonising over the ‘shall I, shan’t I’ than the few minutes it takes to actually MAKE ANOTHER !! When the wings fold back they require support at the root in the form of something called a Jury strut. 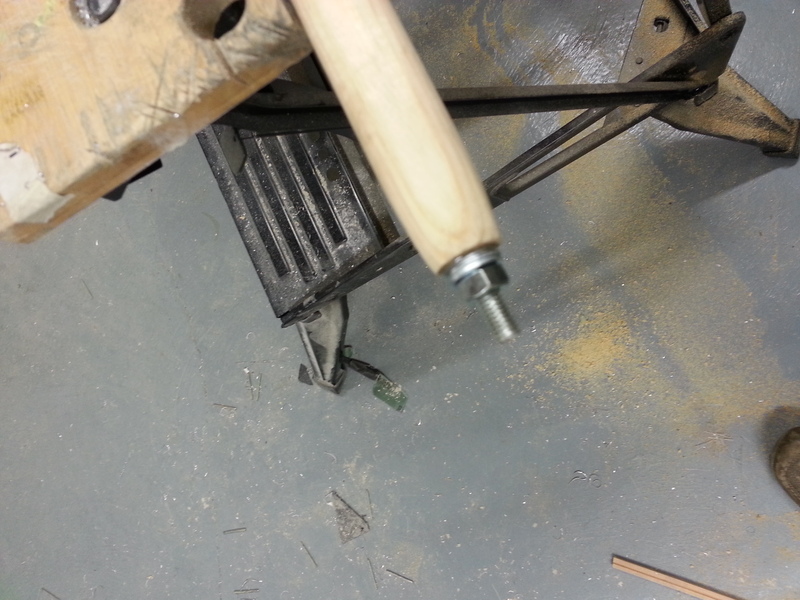 Its made up of some dowels with a hinge point in the middle and then have pegs in each end that locate into the mounting brackets above the lower and below the upper wing. 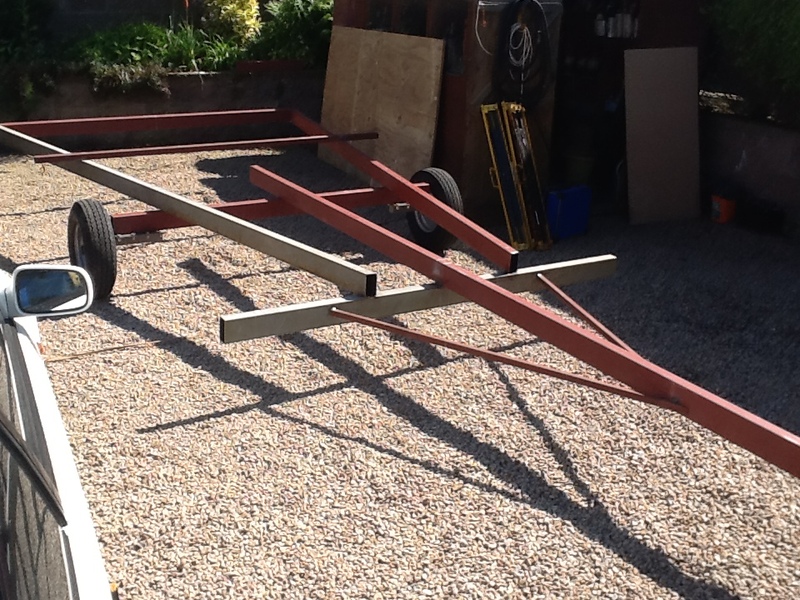 My very good friend Mike Fleming has kindly managed the sub project of trailer spec and build. Having bought the 4×2 steel bar he has laid it all out and now welded the framework in place. Just need to finalise against the ‘plane and confirm wheel track to weld in the wheel mounts. Then the running boards that support the folded wings. Mike has already test run the trailer on our very small bumpy Jersey roads ! 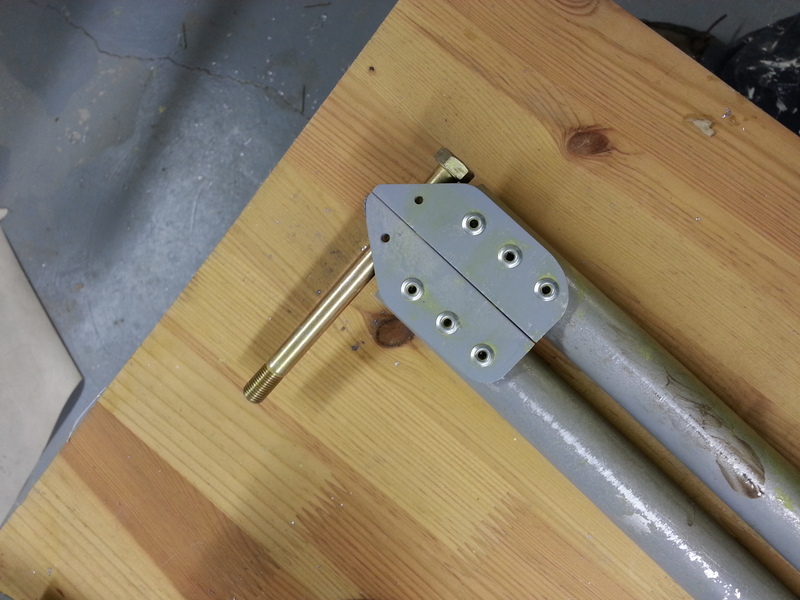 This is a small rod that has a couple of brackets (one each end) made up of a top and bottom plate shaped to fit up to and around the aileron bellcrank support tube and then the but up against the drag brace. As it was getting pretty late by the time I started these I thought I would just get the outline curves in the metal brackets to see how they would lie. They seemed to go reasonably well but the rivet size doesn’t match any of my cleco sizes which is a pain … so will think of a different interim securing method to allow mock up in situ before final etch priming and riveting. 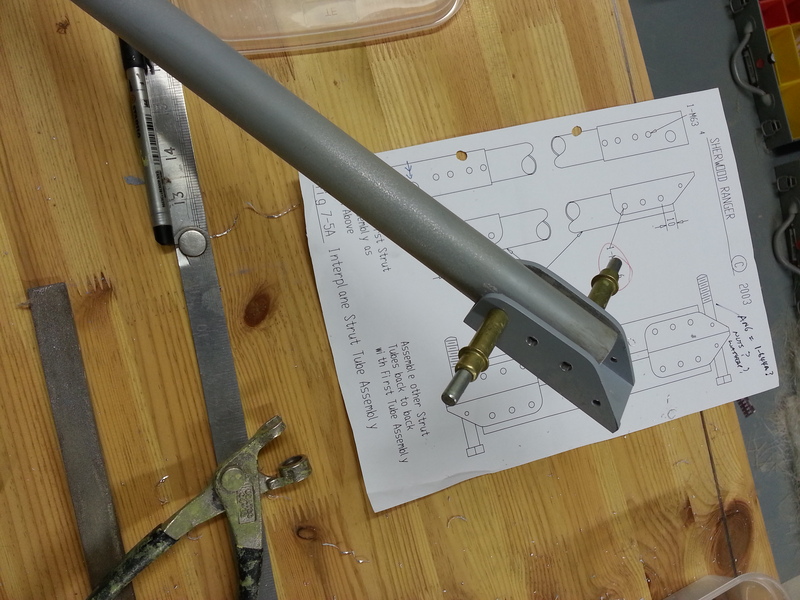 It was another post midnight last night as the 4 wing strut posts were drilled, assembled and aligned. 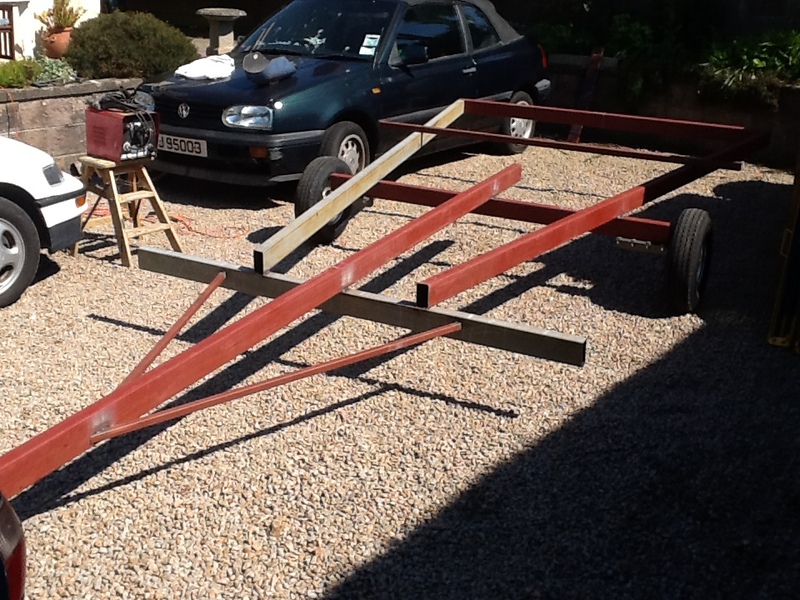 The build diagrams suggest building them back to back in matched pairs .. a very sensible idea if you would like Port and Starboard wings to have equal spacing and support ! It was a post midnight effort on Saturday .. with so many bits coming together and with it really (really !) starting to take shape now its difficult to know when to stop. Building in the barn late at night with Peacock screeches outside in the dark is quite eerie ! 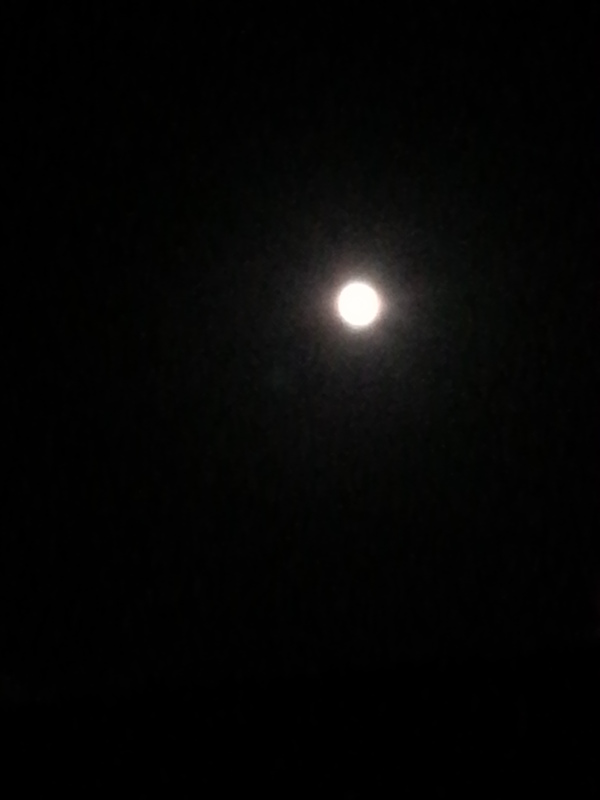 but you can crack on usually without interruptions. Keith (the barn owner) occasionally pops in with a wide eyed visitor which is nice as it gives you an excuse to stop and actually look at the watch ! This Saturday it was very quiet and industrious ! The problem is – with a young family living next to the barn, I have set myself a self imposed ‘noise curfew’ of around 10:00 pm .. after which I wont drill or hit anything with a hammer (not that I have to resort to hammers on the aircraft !) ….